Fast fashion uses materials and production practices which are harmful for the environment. We bring you sustainable alternatives such as Tencel and items made from deadstock fabrics, in cute designs to fall in love with. Globally, wages in the fashion industry are only half of what could be considered a living wage. There are an average of 5.6 accidents per 100 workers - nearly double compared to similar industries. Our brands ensure their workers are paid a living wage in a safe environment. Our extra soft natural fabrics such as linen and ethical wool are kind to your skin and our planet. We also stock a range of GOTS and Oeko-Tex certified materials so you know you never touch any harmful chemicals. Artisanal items are unique. They are the contemporary expression of millennia of craftwork and traditions passed down through generations. Small batch, handmade items are the perfect alternative to fast fashion's mass produced lines. All of the brands on Honest Department’s site must fill atleast one of their values. Personally I enjoy these kind of curated online stores because it makes it so simple to find brands that align with your values. You can just focus on finding the right garment. Right now I’m loving linen so this blouse by Arkitaip was love at first sight! I also love how comfortable and cute these shorts by Sitting Pretty are. This post was sponsored by Honest Department. The clothes that we choose to adorn our bodies with carry meaning. Before they reach the consumer’s hands there are stories behind where the material was grown, the factory in which the cloth was manufactured, and the person who sewed the garment together. As a fiber artist and consumer, my goal is to honor the meaning behind textiles and add my own designs into the mix. The illustration “Buyerarchy of Needs” by Sarah Lazarovic defines a new paradigm in our consumer-based society. (1) Since seeing it for the first time, I have copied the words down in my own journal and begun to implement the tenets that Lazarovic promotes. For my art practice I am habitually adding fabrics to my collection by seeking out thrifted finds and second hand materials. It has been relatively easy and inexpensive to purchase only second hand or material off cuts for my work. However, buying nothing and relying solely on what I have and swapping with others has taken a few extra steps. One of the ways I’ve been able to abide by the tenets Lazarovic presents and continue to produce new work is by learning how to mend. Mending techniques have become an important part of my design aesthetic that it is an effective way to add visual interest and added texture to existing garments. I’ve mended a hole in denim step-by-step to explain one of my favorite mending processes. The mending, or darning style, that I depict is bound by a basic woven grid structure. Because I work with these supplies often I was able to use a needle and thread I already had. My thread is sourced from Offcut Basel, a second hand material and art supply store in my region. Step 1: Clear away any stray threads or ragged edges from the hole.Thread your needle without a knot but leaving a long end that you can weave back in later. Choose your darning thread or yarn. I’ve chosen embroidery floss that is thicker than the denim material because it is easier to see the process, but for invisible mends I recommend thread that is similar in weight and color to the fabric. Step 2: I prefer to outline the edge of the hole with a quick stitch, this isn’t necessary with sturdy fabrics, but with fragile ones it provides a stronger foundation for the darning stitches. Step 4: After you’ve created a few stabilizing stitches above the mending hole, pick up the edge of the hole, going under the edge, thread through and end by going over the bottom edge of the hole. Create a few reinforcing stitches on the other side of the hole. Step 5: Repeat steps 3 and 4 until you’ve created vertical lines of thread going across the entirety of the hole. The back side of my work has diagonal stitches leading me to the next row. Step 6: With the needle on the wrong side of the fabric, I chose to make some stabilizing stitches on the right side before I start weaving horizontally over the hole. It is also possible to immediately begin weaving through to the over side without these stitches. Alternate the weaving pattern with each row as you go over and under every vertical thread until you reach the other end of the hole. Step 7: Weave in the ends on the backside in a similar way to how you’ve been working on the front. Weave over and under a few threads and turn the needle and do the same in the opposite direction for security. With this basic understanding of how to create a new woven structure where one is missing, feel free experiment, break the traditional rules, and add your own aesthetic to future projects. For example, to complete this project I chose to colorfully embellish the surrounding area with the simple running stitch that we learned above. This piece is a part of my collaboration with the German upcycling brand, Planet Stetten. We are designing a capsule collection that combines hand-embroidery techniques with screen-printed text that promotes the importance of valuing quality clothes that have been discarded in favor of fast fashion trends. If you are not interested in sewing or mending by yourself (it can be time consuming, tedious, and knot-inducing!) I encourage you to seek out artists and designers that will alter clothes for you. Ripso is a U.S.A. based platform that offers customizations to its customers by pairing them with a designer that specializes in their chosen customization. These few tools can extend the life of the clothes already in your closet and add a layer of personal value to your garments. My journey away from fast fashion has had many nuances to it over the years - but I’d say this one feels the most sustainable. Quitting fast fashion and being vegan for me meant that I didn’t buy anything made of animal materials - even thrifted. That made second hand shopping a bit difficult sometimes, and after reading about microplastics and all the other downsides of synthetic materials, I knew I didn’t want to support that either. So, what’s left? I came to the conclusion that if i truly wanted to be ethical and ecological, second hand natural materials are the way to go. They’re long lasting, require less washing and don’t release microplastics into our oceans. My favorite materials for the summertime are cotton, silk and linen, and in the wintertime I try to find wool and cashmere. I do own quite a few pairs of vintage leather boots from the 80’s-90’s, mom style is my favorite! Second hand shopping for natural materials works for me because it’s affordable, the clothes are long-lasting and you’re not directly supporting the industry. Look at the tag. This might be a bit obvious, but when I see a piece I like the first thing I check is the tag, and material. I try to avoid non-biodegradeable materials like nylon and polyester. Smell it. Natural materials, especially wool has a spesific scent. It can also collect smells so it’s good to check before buying. Care: Don’t wash sweaters and other thick items of clothing too often. I like to have t-shirts under my knits, so I only have to wash the t-shirt and I can just air out the knits, or wash them once a month. Air it out! The best thing about cold weather is airing out your clothes. It kills bacteria and makes your clothes smell fresh and clean. Hangers - I try to hang all of my precious items - like cashmere sweaters and wool pants. That way you’ll guarantee a longer lifespan and they wont get wrinkled. Get minimalistic - you really don’t need 10 different sweaters, having a few trusty ones in rotation is well enough. Less is more! There’s something about wearing pieces that are made with care, meant to last. Wearing these clothes makes me feel strong and feminine, yet calm while knowing they clothes are made ethically and as sustainably as possible. Antibad is a curated webshop made for the conscious- yet style oriented woman. Each piece on the site is carefully selected and the brands they represent are ethical and sustainable. Organic cotton t-shirt woven on restored circular knitting machines in the Swabian Alps. I love denim. You can combine a pair of jeans so many ways, yet one of the simplest ways seems to work for me the best. A good white T-shirt and a pair of square-toed shoes goes a long way. I’m almost exclusively wearing vintage denim these days, and I wanted to share why. First of all, it takes an obscene amount of water to make one pair of jeans. Just one. Also many fast fashion brands actually make the jeans material much thinner, making it break more easily and lose it’s elasticity. Another reason is I’ve started to pay attention to the material of my clothes, to reduce releasing microplastics into our waters when I wash them. Natural materials like cotton are much more long lasting, environmentally friendly and honestly, comfortable. Not to mention easily recyclable! Also, I don’t feel like i need to wash vintage denim that much. It doesn’t catch stains easily, doesn’t wrinkle or lose it’s shape. If anything, it only gets better when you wear it and don’t wash it. It gets softer and sort of shapes itself especially for you. They don’t make ‘em like this anymore. Finding good vintage jeans is kind of like finding a soulmate. It’s 4eva. I would search in different vintage stores, especially when you’re traveling in Europe. You can also find some good ones onine, like mine! I got these from Radhica Vintage, a Finnish curated webshop for cool vintage finds. I love thrift shopping. To me it feels like being on an ever lasting treasure hunt. Sometimes it can take months (even years) before you find what you are after, but once you come accross the perfect piece, in the perfect size and at an affordable price, you basically feel like as if you have won the lottery. since spending this summer at what's your legacy i've come across a lot of new beautiful sustainable clothing brands. As Most sustainable brands are a little pricier i think it's fun to balance it out with the cheaper thrifted pieces. when shopping from a sustainable brand feels more like investing in something i know i'll love for years to come, the fun side of trying and experimenting can be kept in the fashion game through taking more risks when thrifting. Often when speaking of natural dyes it's the vague yellowy brown colours we start to think of. Nothing too exiting or a tad too ''hippie''. But once you start to look into it, you soon learn that the world of natural colours is as wide as your imagination runs, and definitely fun to explore! We've had our eyes on Fragmentario for the past couple of months, which has been inspiring us with its beautiful colour schemes using natural dyeing. Fragmentario is a Brooklyn based creative studio where beautiful designs are created with textiles and colours extracted from plants ranging from flowers and spices to seeds and vegetables. It inspires us to look at natural dyes in a new light. Would you have guessed that the beautiful peachy hues of the SS18 collection are created using avocado seeds? We had a chat with the lovely founder María Elena Pombo and were curious to learn more about natural dyes and what it is that inspires her work. My name is María Elena, but most people call me Mari. Under the moniker Fragmentario, I use plants to color fabric and create independent and commissioned work. I also teach natural dye workshops in my Brooklyn studio and elsewhere. I am originally from Venezuela and moved to New York to study fashion design at Parsons. Afterwards I worked for some time as a designer for different companies here until I started working on Fragmentario full-time. What sparked your inspiration to establish Fragmentario? I come from a fashion background so my work will always relate to that industry in some way, but my most important inspirations for this project were found outside of fashion. Art book fairs, independent film festivals and the slow food movement gave me the perspective that questioning ideas that are normalized in society and proposing new systems can be very powerful, fulfilling and fun. Can you tell us more about natural dyes? Using plants and other natural sources for color was once a widespread practice across all cultures. When people think of natural dyes today, they think mostly of Mexico, Peru and India, but everywhere in the world, humans were making colors with what was available in their environments. The practice was also not limited to fiber, even cave paintings were done with a mix of animal, vegetable and mineral sources. With the accidental invention of faster-acting and more consistent synthetic dyes in 1856, natural dyes were quickly replaced. In recent years, natural dyes have had a slow resurgence. Beyond the environmental appeal, they provide a greater connection between process and product and a way to connect with civilization's history. How did you come up with the idea of using avocado seeds for dyeing? After I graduated from Parsons I was helping my husband make bags inspired by vintage workwear. He didn’t like the colors we found when looking for organic cotton and proposed that we dye the fabric ourselves with nuts and onions. I was curious mostly theoretically. I imagined dull colors and a very complicated process. He then showed me the work of Maura Grace Ambrose, a natural dyer in Austin who makes amazing quilts as Folk Fibers. With her work, I understood that the colors made with natural-dyes were very vibrant. I was most surprised by the color drawn from avocado seeds. The avocado is such an integral part of the culture in Venezuela where I grew up, yet I had never heard of its color properties. We love the look of your first clothing collection! What inspired you for when it comes for the design? Thank you! As I said before, avocados were an important aspect of my upbringing, we even had an avocado tree at home, so using them brings good associations. I have also become very obsessed with their current ubiquity and the effects (good, bad and ugly) of their popularity. I wanted to explore working with them and using apparel as a medium to start conversations about waste, cultural heritage and time. The silk and linen fabrics used are very luxurious but were found via deadstock fabric providers, so just as the avocado seeds, they are having a second life with this collection. Similarly, the design details share with the natural-dyeing process, a resistance to today’s obsession with speed. Using buttons, instead of zippers, and silk and cotton thread instead of polyester, it encourages both the maker and the wearer to slow down. It was important for me that these garments were recognizable as objects but that their time and context would be more challenging to identify. How do you try to be sustainable? Sustainability means something different for many people. For this reason, while I try to be as conscious as possible, I don’t talk about my work as “sustainable” but focus instead on the specific measures I take: using food waste and deadstock fabrics, minimizing my water usage, working with a local factory that treats its employees with dignity… To me, focusing on the concrete actions I take, instead of vague notions, feels more honest and encouraging. Finally, while there are serious reasons behind the way I work, there can be a lot of humor behind it. Stalking friends so they save their “trash” for me, visiting my factory when it’s one of their employee’s birthday and staying with them for cake, getting a good work-out with the physicality involved in natural dyes. I enjoy the process and emphasize this when talking about my work, as I feel this will be more sustainable in the long run. What would a perfect workday look like for you? what are three of those slightly random things that give you joy? If we were visiting New York what three places would we definitively have to check out? I think the magic of New York lies more in the experiences than on specific places. I am also a big fan of the East River, so anything that involves it I think is always a good idea. First, you could take the Roosevelt Island Tramway from Manhattan to Roosevelt Island. It’s a commuter tramway so you can use the Metrocard (which is less than $3) and get some of the most unique views of the city. You could then walk around Roosevelt Island itself. It has some of the most interesting architecture in New York City and plenty of secret little spots. We took the collection’s photos there for this reason! I run there often and I still discover new things every time I go. Finally, you could take the ferry towards Wall Street for more amazing views and to experience being in the East River. You could stop your journey there, or continue to Rockaway Beach for a day at the beach! YOU can shop the new Fragmentario's collection here, check out the stunning lookbook here and learn about the inspiration behind this collection here. iluut is a transparent, ethical and mother earth friendly brand built by three strong women with a shared passion - to make a change. Every piece of fabric is traceable, each factory they use is carefully selected and the clothes are made to last. The materials are mostly biodegradable, natural fibres that feel amazing on the skin. Where did you come up with the idea of creating a brand of your own? As a young child my mom always dressed me up very beautifully and her jewellery box was my favourite thing to explore. She's an aesthetician and I become one too. In my early twenties I loved to read catwalk magazines and fashion blogs because they were so full of visual inspiration. But at the same time I saw statistics about the other side of fashion industry: how polluting it is and how many workers suffered the bad working conditions. I started wondering if there could be another way of doing fashion business. I've been blessed with a great work place, the best marketing agency in Finland (yes, it has been dominated as the best agency already twice in a row). Working there has taught me a lot! One of the biggest lessons has been that anything is doable if you just work hard finding a way to do it. I started thinking about it more and more, whether I could find likeminded people to create something sustainable for the women living in Europe. I made my first YouTube video with the help of my mom and husband. Then I bought a little targeted marketing for the video in the most appreciated European fashion cities. I shortly explained my dream and asked if anyone would love to join the project. I was amazed when super talented print designer Silvia, who has been creating designs for example for Zara, Kenzo (just to name a few) sent me an e-mail. She told me she loved designing prints but would love to do it in a different way. We started having Skype calls and brainstorming about our future sustainable brand. At the same time I went through hundreds of fashion design portfolios and was so lucky to find a newly graduate Vj living in London. Her sense of minimalistic style caught my attention. After our first Skype call to my surprise she sent me a moodboard of how our brand could look like. I was so happy! I knew I found my team and after having a little workshop in Portugal, we decided we should really do this together. Then I faced the biggest tragedy in my life. Our eldest daughter, Amanda (the name means "loved"), died totally unexpectedly just two days before the due date. I was thinking how on earth could I continue living with empty arms and huge sorrow. One week after her death I told the girls about what happened and said I would love to do something beautiful that would honor her memory. We decided together to start the company and donate 5 % of each product's margin to a school that would be named after Amanda. That way the children in some developing country would receive a concrete action of love and our daughter's memory could live on in a such a beautiful way. This is how iluut started. :) iluut by the way comes from the Finish word "tuuli" which means "wind", the wind of change that we would love to see in the fashion industry and how we all consume. The warm summer wind is blowing and we just launched our summer dress collection which is in pre-sale, limited time only. It ends on 16.5. Thank you for modelling for this photoshoot, we really truly loved working with you Ona! Dear reader, she looks stunning on the pictures, doesn't she? can you tell me a little about the amanda school project? Oh, sure I'd love to! <3 The school will be built in Ghana by the organisation called Pencils of Promise. I was so inspired by the book of the founder Adam Braun where he shared the story how the organisation was built! They work transparently and share quarterly reports how the donations are used. Also, I love how a professional photographer travels to their schools and shows in social media how the schools and students are doing. Do you have any advice for someone who wants to become a conscious entrepreneur? Do it together with other likeminded people because together we are stronger. Even tough consumer barometers state that people want to consume ethically, it doesn't show in the actual buying behaviour completely yet. BUT it's increasing all the time which makes me super happy! So the more people involved, the more people will hear about conscious choice and step by step the effect increases. We learned this when we did our first crowdfunding campaign at Indiegogo. Follow your vision and work hard for it. And lastly, where do you find inspiration? Such a great question! And my answer is pretty wide: EVERYWHERE! It's funny but my brain seems to work in a visual mood all the time. Where ever I go, I always see the small beautiful things and often think how beautiful picture would be captured there and there... So it's super inspirational to walk in the nature, explore new cities, eat delicious ice cream, see people smiling, visit flower shops etc. And I know my team mates are exactly the same! It's so cool! Also, last year I got to know an inspirational lady who quickly became a dear friend. Our children are the same age and as they take a nap, we take pictures. It's so great to design beautiful set ups and celebrate the beauty of life that way! Small beautiful things around us can create so much wellbeing for everyone and I think seeing people happy is worth of all effort. Clothes made out of nettle, raw silk and hemp, is it a thing? Oh yes it is! New age fashion designer Aino Kovalainen made it happen with her Finnish clothing brand Nokonen. Her brand is totally Mother Earth loving and ready to bring some spring to your closet. We got inspired by the beautiful colors and shapes of her clothes and decided to combine it with some vibrant spring tones from Zuii Organics on our faces. Read Aino's thoughts on sustainable fashion, working for yourself and feeling beautiful. Introduce yourself shortly, who is Aino Kovalainen? I’m a 31-year-old artist soul with a side of diligence and getting things done. My family is from Kainuu, but I’ve spent my life moving around inside Finland and other countries while never really rooting myself in one place. Craftsmanship runs deep in my family. Ever since primary school I’ve felt a calling towards the textile- and clothing field. I’ve always had skills in that area and to this day it’s still the only line of business I’ve been interested in. I’ve always had a strange and lively imagination and that’s where I source a lot of my ideas from. What’s your inspiration behind Nokonen? I’ve dreamt of my own brand for over 10 years, and Nokonen is the result. I finally feel like I’m free to do what I want and work according to my own values. There are no limits or boundaries to my design or execution. I observe my surroundings and gather inspiring things into my mind and combine them into new innovations. I often create patterns just by painting the canvas with whatever comes to mind and letting my paintbrush move freely. Whenever i feel the need for a certain type of garment I simply create one. The best ideas often come from “mistakes”. You need more than just inspiration to create a functional garment. Skill and knowledge about the production process, materials etc. are also very important factors. I’ve kept improving myself in these fields for ten years by studying and working in versatile tasks in design, manufacturing, sales and clothes maintenance. Why is sustainability important to you? How does that show in your brand? Being environmentally friendly has always played a big role in my life. Ever since I was little I’ve been taught about the imporance of recycling, useful plants and respecting nature. Because of this background it’s been kind of obvious for me to build my brand according to these values. The whole production process of Nokonen is sustainable. I use ecological fabrics and aim to design clothes that are timeless and multi-use. Do you have any tips for someone who wants to pursue a sustainable career? Educate yourself and never let go of your values. Being sustainable might not always be the cheapest or fastest way to go, but it’s all the more rewarding. I’ve noticed it’s difficult to stand behind your values while working for someone else since brands often have their own production process already figured out. That’s why I’m happy to be able to build a process that is true to my values. How to be stylish while still respecting mother earth? I think it’s pretty easy. There are new interesting and ecological materials being invented all the time. It doesn’t take much research from a consumer to find a more environmentally friendly option for fashion. Especially smaller brands often pay attention to ethical and sustainable factors. I think natural fibres like nettle, hemp, and banana fibers are a wonderfully luxurious and interesting choice of material. I don’t see why choose anything more harmful to the environment. I also like to to modify old clothes. Sometimes making something new out of something you already own is a better option than buying a new garment. This way you’ll get something unique to wear. You should always pay attention to the quality and material of a garment, whether you’re buying it new or used. High quality clothes are also easier to recycle or modify than low quality. because people tend to thing they can buy clothes with little consideration and sell them later if they have no use for it. Lastly, what makes you feel beautiful? I like to dress bold and stand out from the crowd. When I'm wearing something that looks and feels good, I feel confident and through that: beautiful. For Nokonen I also try to create so called power clothes. Clothes that make you feel good, confident and unique when you wear them. 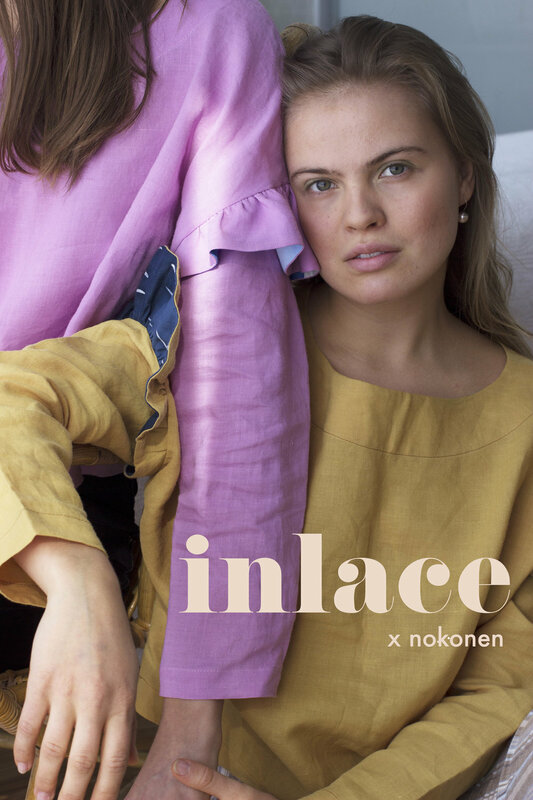 I think the fact that most of Nokonen’s clothes are unique will emphasise the feeling of individuality for the customer. Also fresh air, nature and enjoying what mother earth has to offer always makes you more beautiful! You know those dream like moments, where you can’t stop smiling because you feel like you're exactly at the right place, at the right time, in the right company? I had this feeling when I found myself a 1-hour-drive away from Down Town LA sipping a cocktail at a tiny beach bar, while chatting about sustainable fashion with an incredibly inspiring soul at her favorite beach. I first came across Natasha’s work on Instagram and was soon captivated by the beautiful minimalistic style when it comes to her design. Soon we were planning a meeting via DMs as I was about to visit LA and eager to learn more about the sustainable fashion scene. Natasha is the dreamer, designer and doer behind sustainable swimwear brand Natasha Tonić. Natasha’s swimwear launched in August 2017 with the intention to change women’s swimwear for the better, by shifting away from icky and sweaty polyester, that’s not only bad for your skin but also bad for our planet. The ultimately comfortable and soft swimmers of Natasha are made from a unique natural hemp fiber that is anti-microbial, UV resistant, durable and a healthier choice for your body. How is it to work in the sustainable fashion scene as a designer? Why is hemp fabric a great material for swimmers and how do you even come up with an idea like that? I'll let Natasha tell you more. Could you please introduce yourself shortly? I’m Natasha, I’m from Belgrade, Serbia but I’m half Croatian. These days I live in LA and since summer 2017 I’ve been working on my sustainable swimwear line Natasha Tonić. I wanted to create something that’s not polluting our skin, as we wear our swimwear so close to our body. I also wanted it to be something that you could wear more than just for one season. Swimwear has been made out of polyester for a long time, but I always believed it would be possible to use a natural fiber instead. When I was still working for my previous brand I ran into hemp fabric. I learned how durable hemp is as a material. If you think about it, they make ropes to tie the boat with from hemp. If it can keep the boat from escaping with the waves of the ocean, than why can’t it survive being a bikini? Later I was working with this fabric blend from organic cotton, hemp and four precent lycra. When working with it, I always wondered whether that could survive in the ocean. Then I had a kid and had time to research it. I really tried it out: I swam, didn’t rinse it and hung it out in the sun to dry. I put it in chlorine water. I tested for quite some time but it became clear to me that this blend worked better in swimming conditions, than polyester which I used to wear in the past. did you always want to become an entrepeneur? From when I was a little kid I wanted to become a designer, but being in Serbia everybody thought that was crazy. Everyone was like ’’how are you gonna do that?’’, and so I gave up on the idea. But it was still something I always wanted to do. My father was an entrepreneur so I kinda grew into that idea of doing your own work and figuring out your own thing to find your own spot in this world. Eventually I just decided to do what I had always wanted to do. I picked the best out of all of it and put it together. It’s amazing (bursts out in laughing). A typical work day for me is to wake up and drive to work. Sometimes I go by bicycle (I try to do more of that) and I just listen to the most amazing music. I love the indie music scene and to discover new tunes. When I get to work after I’ve obviously got a coffee, I just work with no music and organize what I need to do during the day. I don't always stick to the plan as that doesn't fit my nature but I just make sure I finish everything that I had in mind. Sometimes I don’t, but it’s fine. If I'm doing creative work and designing I need a 100% focus just on that. If I do marketing I just focus on that. Or than I work on the sales. I can’t do it all at the same time. I’m either creative or business and there’s no in between. When I create I just create and don't think of any mails or such, and if I do business I’m a 100% business and zero creative. What is it like to work in sustainable fashion? What does it mean to you? I think it’s great because the sustainable fashion scene draws you to be even more sustainable. You know right now we’re doing an interview and drinking from plastic straws, which you know is not sustainable at all. Being in the scene makes you more conscious and aware of these things. It also gives you more feelings of guilt, but it’s ok as it’s a part of it. I think people should just try to do the best that they can. I think we shouldn’t feel guilty of the tings we sometimes do here and there as sometimes we can’t even fully control it ourselves. It’s almost impossible in this world to be 100% sustainable so it’s about the idea of just trying to do the best you can. If everyone in the world did their best or even a little bit, it could make a huge change and that’s what my message is about. But back to the fashion scene. When you're working in the sustainable fashion scene you get inspired by each other. You understand that in the end of the day it’s not about competition. It’s about really changing the things in the world for the better. It’s nice to to see what other people are doing, and to feel like the other’s are interested and value the same tings as you do in their work. Still the business side comes in, but that’s not what I stand for. I don't want to be the ugly side of the fashion scene which I feel like is unnecessary. Fashion is supposed to be this beautiful creative thing, instead of an ugly game. That’s what I like about the sustainable fashion scene. People being pure and honest, and there’s this collaborative spirit. Could you tell us a little more about hemp as a material. What makes it special and how did you come across it? I came across hemp by accident. I was just researching things. As I’m half Croatian I’ve always been around the boats and the ropes that tie the boats to the shore, and I remember wondering what the strong ropes were made out of . When in LA I ran into this amazing place that sold hemp based fabric and ropes. And from there the idea just started to develop in my head. I later learned that hemp is besides being super durable also UV resistant. I knew it would survive in the sea, but I didn't know how it would work in chlorine but it did. In the fabric used for my swimwear the hemp is mixed with organic cotton. Cotton is not durable in water on its own, but for some reason in this mix it worked out really well. The fabric feels soft on the body but yet it’s very durable. I was scared to sell something that wouldn't really work, so I put a lot of work in the development. What I loved the most about this blend was it was natural, and I always think natural is better. I never liked polyester, because it makes you sweat and attracts bacteria. It is just bad and uncomfortable. So all together it made sense. I felt it was a tiny miracle that I had found. Besides loving the thought behind your brand I also really love the visual aspects of it. What sparks the inspiration for your designs? I always like to think about practicality in my designs. I also want my pieces to be good for the nature. Something that has always been inspiring me is the timeless look of Calvin Klein back in the 90s. You know the time of Kate Moss. Already as a kid I was inspired by how it was all about the shapes, the simplicity and the practicality of the clothing. That’s why the style still stands the time. In my designs for Natasha Tonic it was all about the clean lines and the shapes and that simple connection to the nature. I wanted to make it different (as most opt for the 70s style) and I chose cool tones like pale blue and black instead of those warm golden tones which are very typical for California. You can wear the swimwear with so may different clothes and it’s easy to just pull out of the closet and combine. My vision is that you can travel and wear the swimsuit on the airplane with a pair of trousers, then you go straight to the beach and you’re ready for a dip in the ocean. After the beach there’s yoga and you can still wear it. It would work like a body suit that you can simply combine with a pair of shorts. I love the functionality of it ,which is possible since it is made out of hemp fabric. Any tips for someone dreaming of shifting their career towards sustainable fashion design? My tip is that you should want to do it for the right reasons. That will keep you going. It is way more challenging than regular fashion design. Every step counts and there are many people that still don’t believe in it. Don’t give up on the first challenges. Don’t get discouraged. Do a lot of research, try to educate yourself as much as you can. And just don’t stop. Thrift shopping is one of the best ways to get creative with your style on a budget. You’ll be guaranteed with a unique look, clear conscience and a happy wallet! Here’s our top tips for a successful thrift trip. If you only go to one thrift shop, you’ll more likely feel like you need to buy something to make up for the fact that you came all the way to the thrift shop. Besides, you’ll double your chances of finding something amazing if you go see more than one selection. It’s important not to set your expectations to the roof. Life isn’t perfect, you won’t always find the perfect piece and you have to be okay with that. Otherwise you might settle for something less than perfect that you probably won’t even wear. Now, expectations and standards are a whole different game. You shouldn’t settle for anything that’s low-quality. Always check for holes and stains, and don’t forget to try it on! If try-ons are not possible, you can also carry a measuring tape with you. If you find something groovy you’re unsure of, just try to mix and match it with pieces that you already own in your mind. Is it really wearable? Where can you see yourself wearing it? Second hand shopping is great for events and festivals because you can just donate the piece back if you’re not going to wear it twice. Here you can really let your creativity take control and not have to worry about anything else! Thrift shopping, as anything in life should be fun! Don’t get too serious with it. You’re already doing a major favour to our planet by choosing to recycle, so you should feel pretty good about yourself. Bring your friends, have crazy try-ons and enjoy yourselves! You can make a vintage moodboard for inspiration or have a challenge for the grooviest outfit combinations with your friends. Get creative! Paris, among other things, is filled with gorgeous vintage shops in various price ranges. Visiting these 3 shops is a great way to get to know the city, as they all have multiple locations around Paris. I recommend checking them all out and finding your personal favourite. Hippy market is definitely on the pricier side, but has some really unique pieces in their collection. Super cool funky 70’s vibe, which I love! They are also committed to being 100% recycled and 100% ethical. Definitely worth a visit. At Kilo Shop pricing is done by weight. These cool shops are filled with treasures and beautiful good quality clothes. They have huge selections, so get ready to spend some time digging! The cheapest option of all. Free'P'star has some very affordable clothing as well as a selection of cute jackets and other things. It's by far my favourite, since it has that authentic thrift-store vibe to it. New clothes are coming in constantly, so you can visit as often as you like, and not see the same garms as you did the last time.